Survey: Do Patients Really Care if You Use Your EHR in the Exam Room? Note: This post was written in 2014. 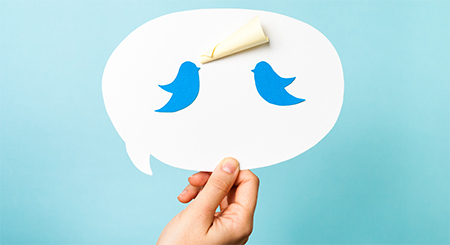 We’ve written more content with new research since then, including #LetDoctorsBeDoctors: 5 Funny Tweets To Spur EHR Improvements. Many physicians worry that using an electronic health record (EHR) system in the exam room may damage the patient experience. We covered this issue a while back, offering physicians advice on how to maintain patient interaction even while using an electronic charting device during exams. Yet many physicians still hesitate to embrace EHRs in the exam room. Even in practices where EHR software has been implemented, many doctors continue to use paper during exams, documenting notes in the EHR only after a patient visit has concluded. The idea behind this method is to preserve the patient experience, but recording the same notes twice is extremely inefficient for physicians, wasting precious time that is already quite limited. But what do patients think? Do they really care if their doctors use electronic devices to take notes during exams? We surveyed a random sample of 4,500 U.S. patients, collecting a minimum of 500 responses to each question, to find out how patients feel about doctors using EHRs at the point of care and what truly impacts the patient experience. Here’s what we learned. In each case, more than 80 percent of respondents indicated they would not be bothered. On a sliding scale, patients indicated the least concern for doctors using tablets during the exam. Next, we asked patients about the extent to which they’d be bothered by doctors using scribes, meaning third-party assistants who transcribe patient visit notes into an electronic chart while the doctor conducts the exam. Some two-thirds of patients still indicated they wouldn’t be bothered by this practice. However, patients were almost twice as likely to express concern over the use of scribes than over the doctor typing directly into a computer. About 60 percent of patients indicated that they wouldn’t be bothered by the prospect of doctors using tape recorders to record medical notes during an exam. 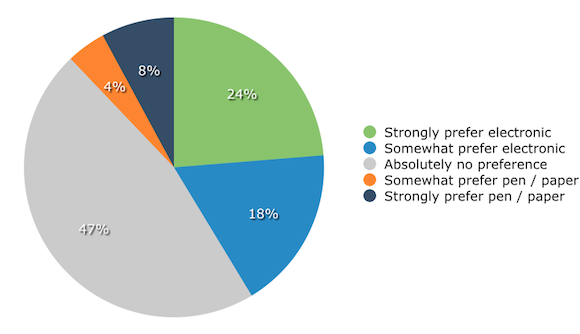 However, of all the methods we asked about in our survey, patients expressed the most concern over audio recording. Ultimately, over one-third of patients said they’d be bothered by doctors using tape recorders to assist in charting medical notes. Specifically, patients at the furthest end of the spectrum—those who chose “would bother me a lot”—were more prevalent when it came to tape recordings than with any other method of charting during an exam. Our first few questions established that patients aren’t concerned by doctors using EHRs during exams. But that doesn’t necessarily mean they prefer EHRs to paper—so next, we explicitly asked them for their preferences regarding paper versus digital charting during visits. Here we see that nearly half of patients surveyed had no preference between doctors using EHRs or using pen and paper at the point of care. However, if we filter down only to patients with a preference (i.e. 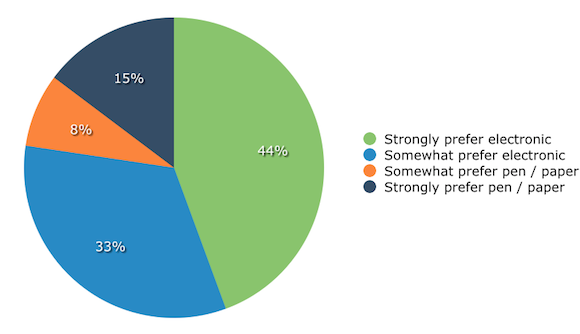 if we eliminate “absolutely no preference”), the support for EHRs is significant. It’s important to note that we specifically asked patients about what method they prefer doctors to use during an exam, at the point of care. This means, for example, that doctors who use paper in the exam room and then add notes to their EHR afterward would be acting against patient preference, according to our data. Additionally, I was interested to find that these preferences are similar for both genders and all age groups. The percentage of patients with no preference grows as age increases (in other words, older patients are less likely to have any preference one way or the other). But in all cases, preference for EHRs dominates preference for paper charting during exams. If EHRs don’t create negative patient experiences, as some doctors have feared, then what does? 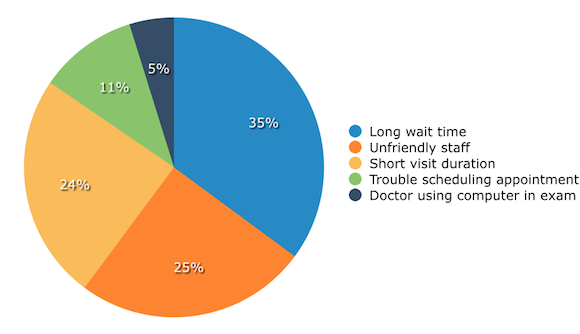 We asked patients which factors most impact their satisfaction with a visit to the doctor. Specifically, we asked whether a negative experience with each of several factors would decrease patients’ satisfaction with their doctors. Patients indicated that long wait times at the doctor’s office, unfriendly staff and short duration of visits with the doctor would most drive dissatisfaction. The prospect of their doctor typing on a computer during the exam had the smallest negative impact, with only 5 percent of respondents indicating this would drive dissatisfaction. Here again, I found these preferences to be similar for both genders and all age groups. Wait times, staff friendliness and duration of visits rotate in and out of first place for different age groups. But “doctor typing on a computer during the exam” is the smallest percentage for every age group, as well as for both males and females. Despite publicized concerns about the negative impact of EHR use during exams on patient satisfaction, our study demonstrates that patients by and large care very little about their doctors using EHRs at the point of care. In fact, to the extent they have preferences, patients distinctly prefer that doctors use EHRs over using paper to take notes during visits. Patients ranked tablets the most preferable method of electronic charting, followed closely by laptops and desktop computers. Patients were slightly more concerned by the use of scribes, and even more so by the use of tape recorders, perhaps due to privacy issues (such as those raised by both doctors and patients regarding the prospect of introducing an additional entity to the exam). Still, more than half of the patients surveyed said they wouldn’t be bothered by scribes or audio recordings, either. Our advice to doctors would be to embrace EHR technology—and, for those already using it, not to shy away from using electronic charting at the point of care. For doctors who want to minimize patient dissatisfaction, energy is better focused on the factors that most impact the patient’s perception of the visit: wait times, staff friendliness and visit duration. To further discuss this report or obtain access to any of the charts above, feel free to contact me at melissa@softwareadvice.com.